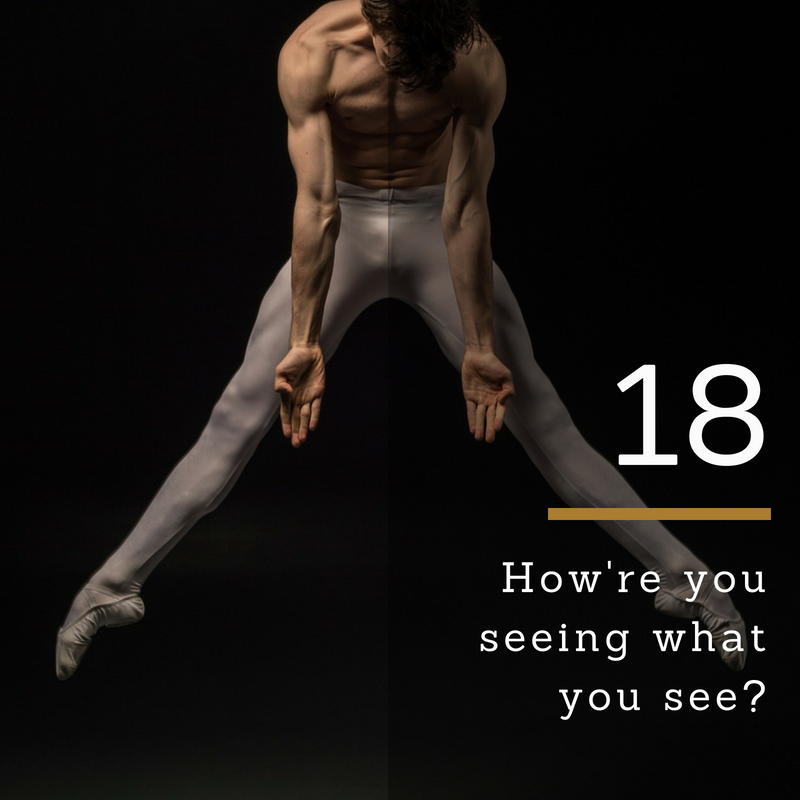 Ep 18 – How’re you seeing what you see? How’re you seeing what you see? Perspective is not just about what you see, but how you see what you see. In this episode, Marlita Hill continues the conversation on patience and looks at how perspective helps us successfully navigate patience and fully come into the things God has promised us. In episode 17, we started a conversation about patience, about what being a career artist looks like inside of the faith process. We talked about patience being a necessary part of faith, and time being a necessary part of patience. We ended that conversation exploring how we could be, and remain patient. Last week our tool was remembrance. In this episode, I want to explore the tool of perspective. As you are walking out God’s promise to you for your career life, it’s important for you to check yourself at each juncture about how you’re seeing what you see. In numbers 13 we read the account of a group of men who were challenged in this very area. In this account, the Lord tells Moses to send some men to spy out the land God promised to the Children of Israel, land He said was theirs and, at the time of directing Moses, was in the process of bringing them into it. Verses 21 through 24 tell us that the men go out. They spy out the land and they collect fruit from the land. Verse 25 picks up saying “And they returned from spying out the land after forty days. Basically, ain’t no way we getting in this land. Now, this is interesting because perspective is not just about what you see. It’s about how you see what you see. Remember, they’re in the process of being brought into their land of promise and this step of seeing what’s there is part of bringing them into the land. They were not sent to find out IF they could get in; that was already settled. They were only sent to find out what was there. But they lost sight of that and instead spoke about the situation and made conclusions about it from the wrong way of seeing it. They reported from the wrong perspective. It wasn’t the fact that they reported these difficulties. The difficulties were there and they were real. It was that they lost sight of why they were sent there, and of what to do with the difficulties they saw. They didn’t come back and say here’s what’s going on. Let’s seek God about how to deal with this. No, they didn’t say that because that’s not how they saw the situation. And if you’re going to get all the way into what God showed you, you have to check yourself on how you see what you see, so that you don’t talk yourself out of God’s promise because of what you see. I just think this is so funny because these men are like no, y’all didn’t hear what I said. I said the Canaanites are here the Jebusites are there, these people are here, you got these giants over here. We can’t do this! And there are times when you’re walking out God’s promise that it feels like all around you, no matter where you look or how you look at it, there is no possible way you’re going to be able to do this. I remember driving home one time after the Lord had told me to leave my job and I just felt like my chest was going to cave in. The pressure of feeling like I had no possible way of making it through this and getting into what God told me to leave my job to do felt like I had on a corset that was too tight. The story goes on with verse 32. “And they gave the children of Israel a bad report of the land which they had spied out, saying, “The land through which we have gone as spies, (now stop for a moment, because again, this was the land that God said I’m giving you; it’s yours. This is the land they were in process of inhabiting. This is the land they’re talking about). “And they gave the children of Israel a bad report of the land which they had spied out, saying, “The land through which we have gone as spies is a land that devours its inhabitants, and all the people whom we saw in it are men of great stature. There we saw the giants (the descendants of Anak came from the giants); and we were like grasshoppers in our own sight, and so we were in their sight,” which is not true because no one even knew they were there. And I’m laughing because this is the insane talk that happens, that truly happens at some point when you step out to believe God. Now let’s remember what was happening in Egypt. They were getting their behind whooped. They were enslaved. They had no freedom. The Egyptians treated them so horribly because they were afraid of the Israelites multiplying too fast. So their life in Egypt was horrible. And the whole reason God tapped Moses on the shoulder was because they cried out to Him about how horrible Egypt was and how they were being so mistreated. They were in the position that they’re in in Numbers 13 because God answered their cry. That’s important to remember. Sometimes, in the midst of God answering us, we forget. Our perspective goes awry, and we lose sight of what we should be looking at. You are in the position you’re in now because of God’s faithfulness to you. Remember how miserable you were behind that desk job? Remember how much you prayed that God would make a way for you to leave Kansas and get to New York? Remember how hollow and depressed you were not being able to do anything with your art? Instead of looking at their current situation remembering they were there because God was faithful to answer and was in the middle of fulfilling His promise to them, instead of seeing that as the next step into promise, they saw the situation as God bring them out there to die, and Him being in the process of trying to convince them to take on a mission in which they were guaranteed to, not just fail, but die. In verse 3 of chapter 14, they continue their moaning and complaining. This is another place we get it wrong because in the process of patience, without the proper perspective, time makes us start to have crazy conversations where we start to devise steps and solutions of our own making. And they are always stupid ideas that make the situation much worse if we actually go through with them. I’m dealing with one of those of my own right now. The story continues with Moses and Aaron falling on their face before the assembly, Joshua and Caleb step up and say bump that! The Lord promised us this land; and He’s going to bring us in. I don’t care what y’all saw over there. God told us this was ours. Let’s go get it. Then the children of Israel say oh yeah, and then they they conspire to stone Joshua and Caleb. Then the Lord flips His wig. He goes off… until Moses says now Lord, if you kill them what will people say about You? If you let them die people will say you brought them out of Egypt and then you killed them because You couldn’t fulfill Your promise to them. So the Lord decides not to kill them, but He vows they will not enter His promise. This episode came out of a recent experience I had that really taught me a lot about following God. More so, it taught me about my responsibility in following Him which is to be careful how I see what I see. I quit my job in June 2016 at the word of the Lord. I went to Spain over the summer, which was an amazing experience. Then I came home to begin the next season. The Lord was continuing to introduce me to new people, unpack my curriculum for the kingdom artist initiative. But financially, I was struggling the whole time. And I am still walking through that season. Back from the amazingness of Europe, back from the high of making the great escape from the 9-5, I was spending a lot of time at home and things were dead quiet. I went from 7 years of being busy, of knowing where I was going everyday, of having lots of phone calls to field and emails to answer and projects to do… to silence. And I’m a person who usually does really well in silence, who’s is able to deal with long periods of solitude and silence and find a lot of peace and enjoyment in that. But in this particular season, which was just a couple months ago, the silence was deafening and was really hard to deal with. I felt really anxious and it was hard to sit still and the overwhelming presence of inactivity was very hard. Not only was I broke, but I was broke and inactive. My phone wasn’t ringing, no emails were coming in. I just felt stuck in limbo. It felt like no progress was being made. At least if I was doing stuff, I could feel like things were moving forward even if the money was not yet flowing like I wanted. And then one day while I was cleaning the house, the Lord checked me and he checked me hard, lovingly but hard, because this was also the period where He told me to start writing the next book. And I struggled to write because all I was focusing on was the fact that I was broke and nobody was calling me and it felt like I wasn’t moving forward at all. All I could think about was the gnawing feeling that I left my job for nothing. When the Lord snatched my behind, he reminded me of the previous four years. Over those four years I was working full-time and I would get up early in the morning to write, or I would stay up late at night to write. I would write on my lunch breaks. I would take my stuff with me everywhere I went so that any available time I had I would squeeze in time to write these books that he told me to write. And because I was faithful when it was difficult, he had brought me into a time where all I had to do now was write, a time where I had the freedom to do nothing else but write. He had brought me into a time of blessing, a time where he was rewarding me and honoring me because I was faithful in the little time that I had to do what he was leading me to do. And his reward was to bring me into a season where I didn’t have to juggle my life to follow him anymore, a time where now, I was just free to follow him. but I didn’t see it like that at first. But after he showed me that, and I realized how wrong I was seeing my current situation, I Repented and I said thank you and I continually thank him for giving me the opportunity to do nothing but focus on writing my next book and continuing to flesh out Kai. I’ve had conversations like the children of Israel, where I missed the time where I didn’t have to worry about how I was going to pay my rent. It was definitely time for me to leave my job. The grace has absolutely lifted. There is no doubt about that. It was time to go. And every time I substitute and try to stick my toe in to go back, I remember very quickly how much it was time for me to go. But there was the temptation, the very real temptation of at least I didn’t have to worry about this or at least I had that. And in those “at least” times, when the day-to-day-ness of walking this out seems overwhelming, when the bill collectors are the people who check on me the most, I remember God’s faithfulness to the children of Israel even in the Manna season. Yes they were in a season of Mana where every day was about just having enough, about wondering if you were going to have enough, and feeling like your whole existence was about having to believe God just to get enough. But I remember God’s faithfulness to them. 40 years they spent in that wilderness with no jobs and the Bible says they lacked nothing. Their clothes never wore out, their shoes never wore out, their feet didn’t even swell. They always had enough to eat. Was it what they wanted? No. Was it what they needed in that season? Absolutely. And I can see that same faithfulness in my own life. Yes, I am in a very, very slim financial season. But my rent is paid every month, I’ve never gone hungry, my lights don’t get turned off, and when I get my eyes on the right things, I can see God beautifully bringing me into the very thing He promised me. I can see His hand at work all around me. So I challenge you to take some time and assess how you’re seeing what you see, right here in the moment you’re in. I challenge you to see God who has been faithful to take care of you and I challenge you to acknowledge all the signs of forward progress He has allowed you to see and experience along the way. Where are some places you’ve lost perspective? What was it like for you when you got it right, again?